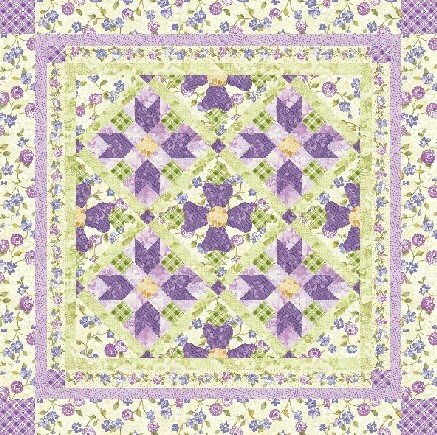 This entry was posted in Quilting, Quilts & Projects: Published, Quilts: Pieced & Applique and tagged American Patchwork and Quilting June 2012, Benartex Perennials II by Eleanore Burns, Floral Spring Quilt, Machine Quilting, Pieced and Applique Quilt, Wendy Sheppard Designs. Bookmark the permalink. Oh, I would so much love to win one of the booklets! My subscription copy arrived without the supplement :-( Not a very nice way to treat subscribers is it? Anyway, I love visiting your blog and especially days when you post your Thread Talk series. I refer to them again and again when I’m attempting to master some aspect of FMQ’ing. Anyway, to answer your questions, I use both soft and bold fabrics, depending entirely on who the quilt is for. Wild and bold colors for boys quilts, softer colors for little girls (though not always, the jungle quilt made for granddaughter #1 turned out to be perfect for that little one’s personality! Have a queen size batik quilt in a pattern called Dream Weaver or Dream Catcher from a Quilt Sampler magazine of several years back waiting for quilting. Undecided whether to hand or machine quilt this one – will be a wedding quilt for daughter. Could you do a thread talk on quilting batiks? This one is batik both front and back – what would you recommend? Sorry, this seems to be rambling, but I think I’ve hit on all your questions! 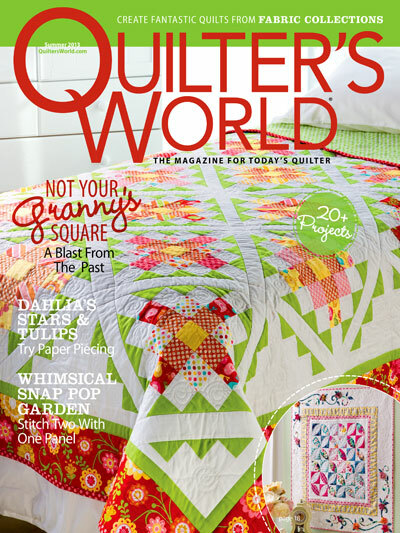 love..love this quilt……I will have to venture out and buy this magazine and add it to my to do pile. LOL Great awe inpiring quilting as always!! If I’m doing something for myself it would be soft colors aboslutely. If it’s a QFK for a boy, bright colors would win. So, in the end, it depends upon who the project is for. Probably the last quilt that I FINISHED from a magazine would be one called Pinwheels (I think) from a Quick Quilts magazine. It was for the oldest granddaughter’s 8th grade graduation, she’s graduating high school in June! As for what to see on your blog. I enjoy any and everything! I LOVE those borders, too! Was the floral border from a striped fabric? So pretty. I’ve never made a quilt, but I did make a pillow once I think from a specialy magazine put out by Simplicity some 30 years ago. I definitely prefer softer colors! Very lovely! I like soft and bold, depending on the item. The last thing I made from a quilt magazine was my purse, from the most recent issue of Quilts and more and I use it every day and love it! I make both soft and bold quilts depending on where I’m going to use the quilt, but if I have to choose, I would go with bold. I love high contrast for it’s impact and fun. Beautiful pictures as usual. I am almost finished with the piecing of a quilt called Friendship Rings from Fons & Porters Easy Quilts “Scrap Quilts” for Fall 2011. I need to join the rows, add a border and quilt it but in the meantime have gotten sidetracked with smaller projects. I’ll have it finished before summer though. As for soft or bold, I love bright bold color combinations but ofcourse use the light, medium and darks of every color to achieve contrast. Things I want to see on your blog, well, EVERYTHING I’ve seen on your blog is inspiring and sometimes downright THRILLING to gaze at your masterful quilting. I love feathers and especially find your detailed pictures very helpful. Thank you for sharing with us. It’s been awhile since I made a quilt from a magazine…..when my sister was diagnosed with cervical cancer I made her a quilt to take to chemo. I used a pattern from Quilters’s World called Tulip Bouquets. I tend to love the soft colors. I so enjoy your thread talks, especially when you give close up and step by step directions for your free motion quilting. Your quilting has inspired me to do some experimentation in my free motion. Soft colors for my own pieces, definately. But when working on something for my “tween” grandkids…the bolder the better! I am new to quilting and am learning so much from your wonderful blog. What would I like to see on Ivory Spring…no question….video tutorials! LOVE your work. Thanks for sharing. I too am turned on by soft colors! Bedrooms and soft color just seem to be two things which should be forever together. However, so many of the things I do are in bright colors so that is perhaps why so many of my things are given away. I’ll have to check out your latest published piece next time I’m near the book store which carry a fantastic selection of quilt mags. Ya’ll have a great week and bless your heart! My last book pattern quilt was a tulip. I believe it was call Delf Tulip(shades of blue). I like bold and soft colors; depending on the pattern. I agree with showing video tutes….the best for me. thank you. I would love a copy of your pattern. I subscribe and think it is a disservice to subscribers not to send them these insert. I won’t be renewing partially due to this. The last pattern I made from a magazine was a charm quilt, but I don’t remember the name of it or the magazine. I am getting old! 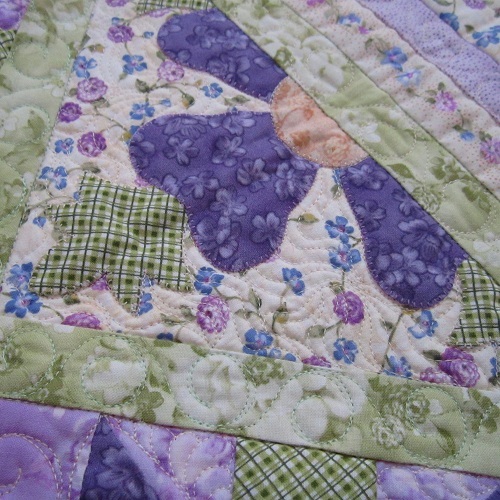 I love bold colors – orange, purple, lime green, but enjoy soft colors, too, like the baby quilt I recently made. I chose to bind it with brown instead of baby blue or pink, though. Your quilt is so pretty, Wendy. But it’s the quilting that makes it spectacular! I’m so proud of you for being featured. You sure deserve all the attention. The last quilt I made from a magazine was a McCall’s pattern for which I won a second place ribbon at the Iowa State Fair. Stiff competition there, so I am proud of that ribbon, especially since the quilt was domestic machine quilted. Though I answered one of your questions, please don’t enter me in the giveaway. Pick someone else, thanks! I am just a beginning quilter and am drawn to the softer shades of color. I am a pastel lover. I recently made a redwork wall hanging from a pattern I had clipped from a magazine years ago but not sure what mag it was. Soft or bold colours in beautiful fabrics are all good. Of course, more Threadtalk. I really appreciate these amazing posts. Thank you. I haven’t made a quilt out of a magazine as of yet. I make both soft and bold color quilts. I would love to see how you come up with how you decide what pattern to use to quilt your quilts with. I have done a few table runners, but nothing fancy on them like feathers or anything. 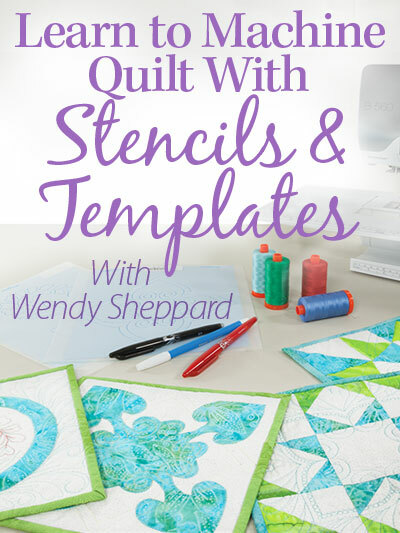 Maybe a tutorial on how to do quilting motifs. Would love to win this, not sure if you would post to France but having a go just in case! I haven’t made anything out of a magazine yet as I haven’t got many. 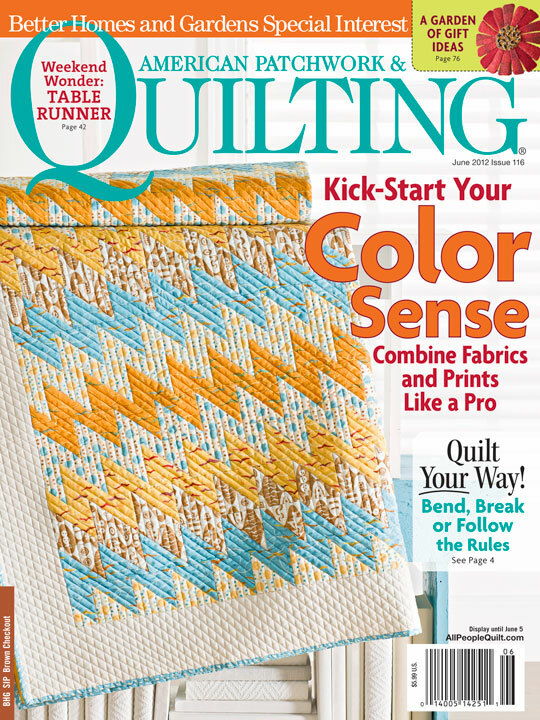 I only started quilting 18 months ago and mags are very expensive to have shipped here. I tend to like shabby chic as in Fig Tree fabric, and I also like French General. I don’t make many large quilts because of limited sewing space but I love working on quilted wearables and purses. I made a vest from a back issue of Quilter’s World magazine and have gotten so many compliments when I wear it, can’t remember which issue but probably could find it if I needed to! As far as colors go, some days I think the “country colors” like barn red, sage, soldier blue appeal to me; but there are times when I see the bright primary colors together in a project and think that might be interesting to work on. If I had to pick one, it probably would be the bold colors. What would like I to see on Ivory Spring’s blog? There’s not much I would want to change because to me its probably one of the best blogs on the net, there’s always something to either learn or be inspired by. I think though sometimes it would be interesting to see some of the projects others have done. Beautiful! I would love a copy of the insert too~ why don’t subscribers get the ‘good stuff’ too?! Soft or bold~ I guess soft, but I also like some bold things. LOL I am working on both! :) Thanks for the chance! Have a happy day! Hi Wendy! As always, just stunning work!! I love the borders too, but I also love the color scheme! Believe it or not, I made a Christmas Santa & Moose applique fireplace screen from an Art to Heart (Heart to Art??) booklet – of course, I didn’t have the fabrics that went into it & had to improvise (I don’t believe I’ve EVER bought a collection), and I used little bitty bells in place of the fabric buttons, but it turned out pretty well, I thought (and so did all my neighbors!). But then we went & bought a little free-standing electric “wood stove” to take the chill off, so we couldn’t use the fabric screen anymore. After only a week or 2, it got taken down & put away….ah well…maybe one of the kids will get it as a present next year! Thanks for the opportunity to win one of your patterns!! Congratulations! I like bold colors. Thanks for the chance to win. Congrats on this gorgeous quilt! 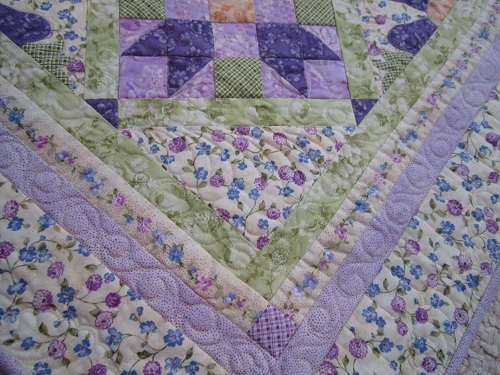 There are so many things I like about it – the quilting, the colors, the overall design….fabulous! I like quilts with bright, bold colors. What a wonderful quilt. Normally I love soft colors but lately I have been drawn to bold colors. I like soft colored quilts, but would be open to making a bold one too. Would love to win; just learned fusible applique today and could use all the help I can get! That is so cool! I have never made a quilt from a magazine. I love soft colors, pastels are my favorite! Thanks for the chance to win! I really appreciate the opportunity to win a pattern as lovely as this one. This is such a lovely pattern. Really speaks Spring! I love soft colors. I have always preferred pinks and pretty floral fabrics. Thanks for sharing a copy of this great magazine. Beautiful work! 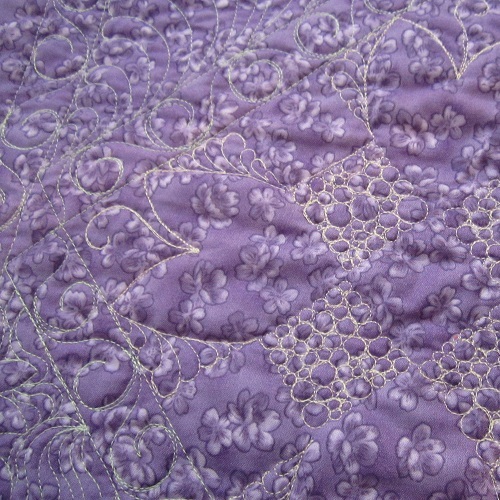 I just love your posts that show close-ups of the quilting. 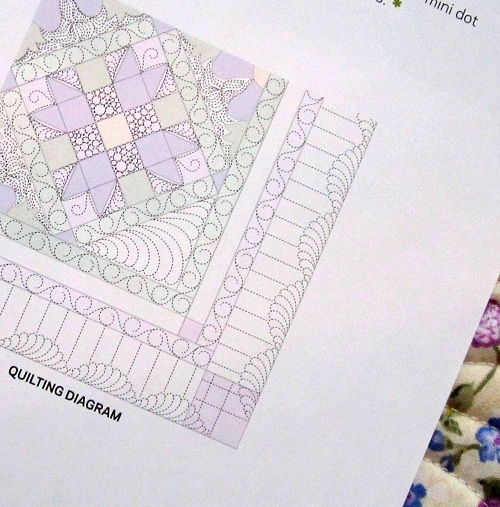 I especially enjoyed seeing the quilting diagram in this post. More of those would be great!! Thanks for all the inspiration! My last magazine was Quilting for Christmas 2010. l discovered your Holiday Spinners pattern and now it’s on my ‘To Do’ list .. even the same fabric. Also, l’ve enjoyed your wonderful blog since that time. Thanks for letting me participate in your giveaway. 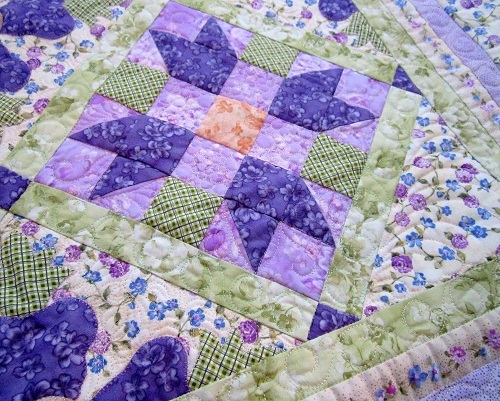 l love your spring quilt with all the purples and greens! I’m really loving the purple. I love everything you do. I would love a copy of the booklet, as I get the magazine by subscription,but alas it was not included for subscribers. I love your Thread Talks and have learned so much from all you share. you are the first blog I check each day, and I enjoy the beautifully photographed quilts and quilitng you show on your blog. As I work to perfect my fmq, I am doubly impressed by how stunning your quilting is, as well as the fact that you sometimes have to do it in the wee hours of the night! Thanks for all you give every day! Much appreciated. I just finished a quilt called Melissa’s Maze from Quick Quilts October 2011 magazine. It is in very bright colors. My favorites are purple, orange and lime green So every quilt I make has those colors I think. I love your blog. I like to learn new stuff so I enjoy that part of your blog. I haven’t made a quilt out of a magazine yet, since I am a beginner and finished just my very first quilt 2 easy ago :D.
I like both soft and bold color quilts, it depends on what I will use it for. This too is lovely! I am in a transition of sorts. Have made a couple of brights for other people, and love them, so keep adding to my bright scraps. I have to say that i love your “thread talk” , Wendy. When i see that on the blog title i get excited. I have learned so much from following your blog. Have gotten my feet wet so to speak. You have an easy, gentle way of encouraging. I feel like you appreciate your beginnings and believe in us out cyber quilting school. I believe God has given every woman the ability to create on some level. Encouragement is so important. The thoughts of dear Miss Baby with that umbrella made me laugh. My grand daughter is almost four so imagined her doing the same thing. Precious little ones! I have made several quilts from magazines and I love brights and pastels. I tend to buy brights all the time but love making pastels. I am sure there is no need for me to purchase more fabric but alway love to see the new designs out there. Would be fun to win and make one of these quilts. Bunny Good luck to all. I love soft colors for my quilts! i like all kind of quilts, but mine MUST have contrast. i want to see the pattern. i worked hard on it and i don’t want it to be lost with poor contrast. i do bold, soft, dark, bright, medium…….just make it contrast. 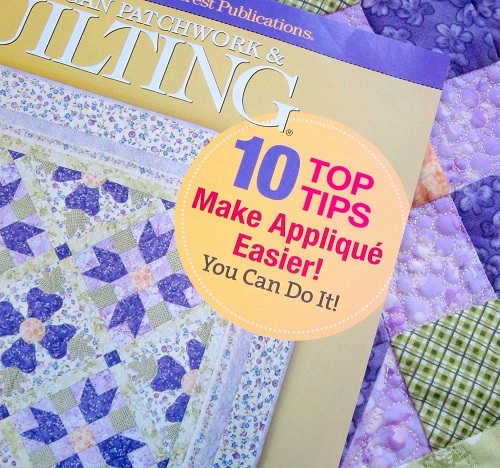 I began my quilting experience 8 years ago while participating in a shop hop with my mother. My first quilt was from that shop hop and it was the beginning of a wonderful adventure. My first quilt from a magazine was a table runner 7 years ago and I do not recall the magazine or pattern. I now facilitate a quilt club and teach classes in my home. Love helping others to learn and improve their skills and knowledge. I have favored soft colors in the past but now venturing to bold colors; it seems to depend on who is receiving the quilt. I really enjoy reading the Thread Talk but I appreciate learning as much as I can to help myself and others enjoy quilting. I don’t think any of the quilts I’ve made came from a magazine, but I have adapted other ideas to either quilts or purses I’ve made. I either use a purchased pattern or book, or design my own. I do love your blog, the information you provide, and your work is stunning. I look forward to seeing this issue and reading the supplement. I even liked your lame foot joke, lol. It wasn’t lame, because I laughed. 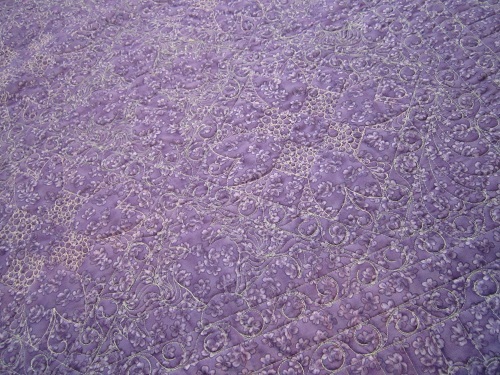 Oh, I also love purples, and your quilt is a beautiful creation with Eleanor’s lovely fabrics. I’m not into brights, per se, but do love colors. It depends on my mood, I guess. Keep up the wonderful work! 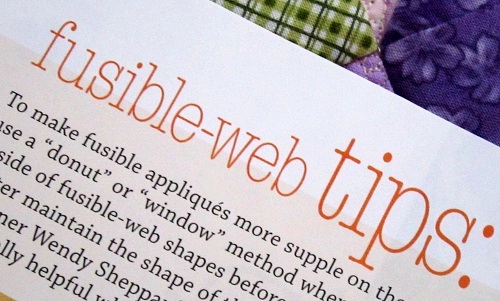 I rec’d this publication a couple weeks ago… DRATS… that section is not included in home delivery magazines…. NOT FAIR!! I love to applique, but need guidance. 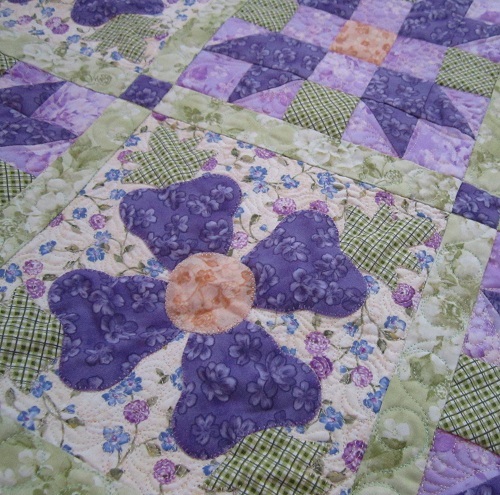 Just finished pieced lavender and pink pastel colors in my granddaughter, Gwyn’s, birth quilt. She is arriving any day. I love all colors! sometimes bright, sometimes softer pastels. Depends on the quilt… Getting ready to start the fishing quilt you gave us free patterns for. Thanks again! It looks fun. Fabrics are awesome! Beautiful quilt! I’m thinking my passion for purple is gonna end someday, but not today. I love both soft pastels & bold bright colors. Not hard to please at all. 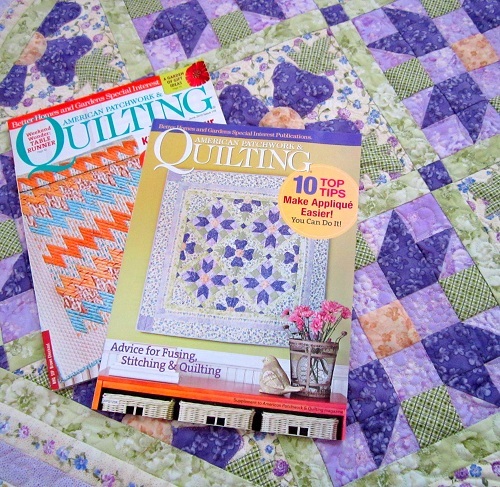 Magazines give me the inspiration to make certain quilts – and I love those that have quilting motifs (we handquilt) that generate ideas too… but yours has PURPLE and I love the colors in it … so please count me in … I like most colors and soft vs bold gives contrast. About two weeks ago I made four very small quilts from Sept/Oct 2008 Quiltmaker. They were paper pieced quilted potholders and the pattern is called Pick a Peck. They were a shower gift. I like both bold and soft colors–it depends on the pattern and who it is for. Hmmm….I didn’t get it in my subscription. It looks wonderful. I always check out my magaizines for your wonderful work. I tend to go for the bold looks for myself. The quilt I am finishing now is a pattern from American Patchwork & Quilting. It was from an older issue and is a pattern called Harvest Home. In the magazine, it was a scrap quilt in a variety of colors, but I chose to do it in blues (especially indigo) and white or off-white. I love how this is turning out. I just have one more block to finish then the two borders – hooray! I usally go for softer colors but sometimes a pattern calls for something bold. The last quilt I made for me was from a Fons & Porter Love of Quilting magazine published about 3 years ago. I made a Feathered Star wallhanging designed by Marsha McCloskey with Moda fabrics from the Aviary collection. It turned out so well using softly colored fabrics, my favorite! I would love to see different ways to quilt the same quilt top, such as simple custom, high end custom and allover designs. Soft colored quilts would be my first choice. I also love warm colors but the bolds are my husbands favorites. The last quilt I remember making from a magazine was a quilt titled “Scrap Happy” that was in a McCalls Quilting magazine back in the late 80’s or early 90’s. I still haven’t completed the hand quilting on it! Thanks for the chance to win the great giveaway. Congrats on your inclusion in the magazine. The last quilt I made from a magazine pattern was Crossing Point from APQ. Sorry,I havn´t made any magazine featured quilt up to no, I always have a quilt in my own mind. I like to see magazines for inspirations. 3. What would you like to see on Ivory Spring blog? I came to you about the Thread Talk, I love your quilting and love to read your tips. 1) I made Summer by the Lake from Fabric Trends Spring 2008. I completed it last summer for my daughter to take away to college. It was a black and white with a hint of red quilt. 2)I like contrast in my quilts and usually lean toward warm colors. 3) I love seeing your quilts and hearing about your works in progress but perhaps some tutorials or tips would be nice. In the black and white quilt I did not think to use black batting and there is so much pilling going on that it is terribly disappointing. I love big and bold colors, but I also absolutely love your colors in this quilt! 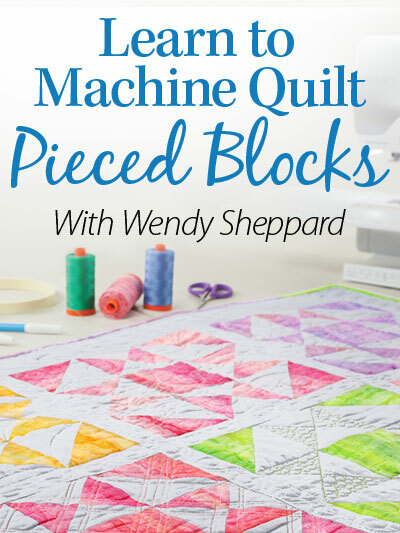 I love everything on your blog–tutorials are so good; love seeing Miss Baby’s outfits; your quilts are wonderful; best of all I love your quilting. Most of my quilts have bolder, rather than softer colors. It reflects my personality, I think. I’m new to your blog, but love what I see here so far! 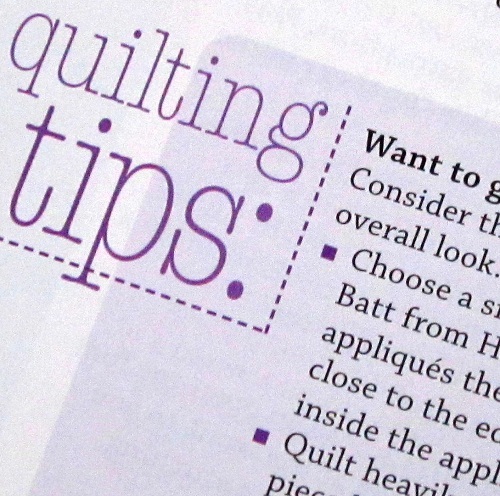 And I’ve never made a quilt exactly from a magazine – I use the magazine more as inspiration, a starting point. Oh I just love your quilt. Congrats on having it published. 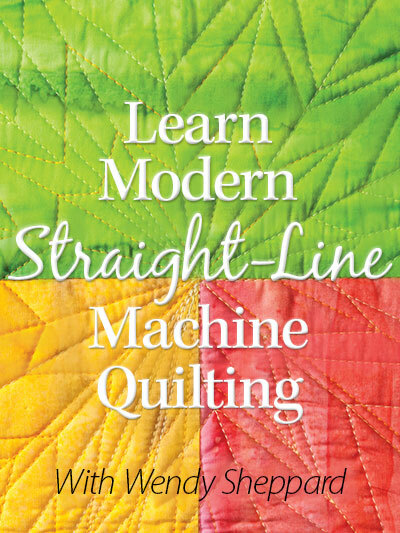 Alas, I’m in South Africa and would give anything to have a copy of American Patchwork and Quilting with the Supplementary Booklet. We miss out on so much here! I love working with bold colours generally, but depending on my mood at the time, I do like to use soft colours haha. I’m not a moody person but it really does just depend on what I feel like sewing. Last year I made a baby quilt and crib bedding out of a Love of Quilting magazine. I think it was from 2008. I like bolder colors, but then once in a while, it has to be something lighter. 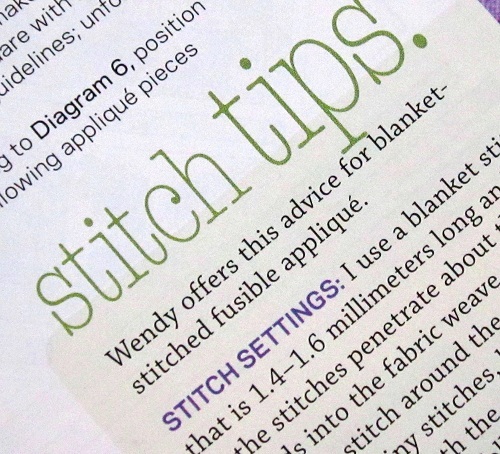 I enjoy reading your blog, thank you for all of your tips and your free patterns. I just love your quilt! congratulations! I love this book. It is hard to say about colors but generlaly I like the bolder colors. I like softer colors, but I’m drawn to brights. I don’t know if they are necessarily bold…just brights….like the one’s in your quilts. 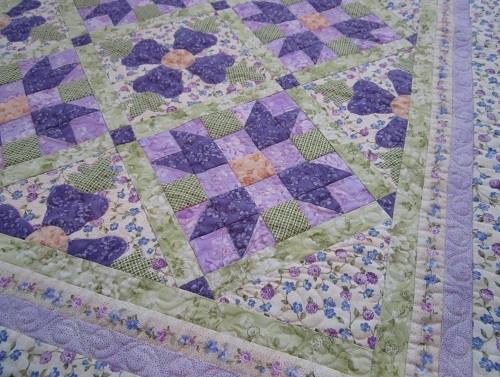 I love this quilt, but then I’m partial to purples with greens. I am trying to move away from soft colors, so I would choose bold colors. My first quilt was white-on-white because I was afraid of selecting colors. The purples in your quilt just draw me in. Thanks for the chance to win. 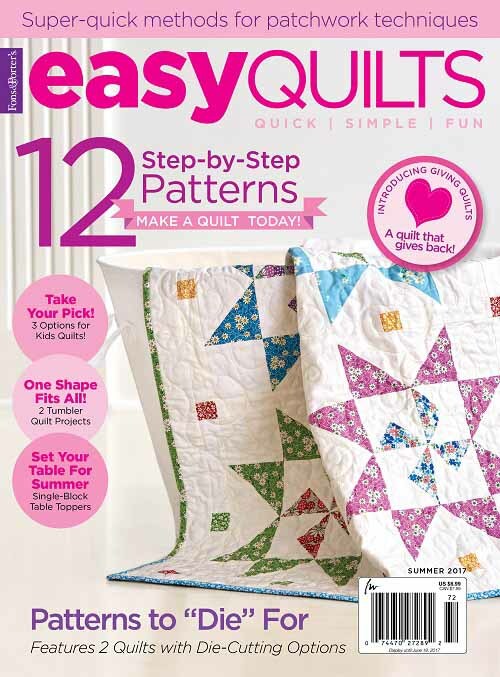 The last quilt I made from a magazine was the Lone Star in McCalls magazine, the latest issue. I like bold colors. Lots of contrast for me. I read all of your Thread Talk hints and love to read about Miss Baby too! I don’t believe I have ever made a quilt from a magazine. Other things yes but not a quilt. I love all colors but am partial to warm colors, browns, golds, etc., I love Civil War Reproduction fabrics and Civil War Quilts, so would I would like to see that on your blog or maybe something really out of sight and bright for Christmas! Thanks for the chance to win. I am a “bold” person. As to what I would like to see? Hmmm…maybe my name as winner? The last quilt magazine pattern I made was Rhapsody in Blue from a Quilter’s World magazine. I made two so far and plan to do another. I tend to go with brighter colors. Your Flower Duet is gorgeous. I have been accumulating lavenders/purples/greens very similar to the ones you used because lavenders/purples are my favorite colors. This quilt will be the quilt I will finally make for “me”. All others have been gifts or for customers. Thank you for the giveaway opportunity! I made the Best friends quilt from a quiltmaker magazine. Love magazines for all the inspiration and color. Thanks for the giveaway. 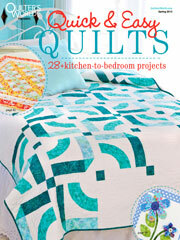 The last magazine pattern quilt I made was Pick-It Fences by Cherri House in the Summer 2011 issue of Quilts and More. I donated it to the Hands to Help Charity Quilt Challenge. I really loved the bright colors against crisp white. It was hard to give it away. I love bright color quilts, but I usually make ones with softer colors. Maybe I’m a little bit afraid of the boldness. I love both soft and bold quilts. I have not made real soft like pastels but I’d love to. I’m working on a BOM that has really bright and bold colors and it’s turning out great. I’m a new follower so I’m not sure what new things I’d like to see, I liked what I just saw and that’s why I’m a new follower. hehe. Seems like I’ve always gone towards a bright palette, but I would like to try a very limited palette for a quilt – pastels, I think. I’d like to see a detailed tutorial on your way of fused applique-there are so many ways to do things. Thanks for the neat giveaway! Have not long been on your email list but just love your patterns, use of colour & especially the quilting, in fact haven’t seen one I didn’t like yet. Always inspirational. Thanks.